As governments meet in Paris to try to thrash out a deal for a sustainable planet, in the tropical rainforest of the Yucatan they are quietly celebrating their own sustainability anniversary. I stumbled upon the plans for that jungle party while on a recent family holiday to Mexico. Like increasing numbers of Brits, I had saved up for a special trip to the Yucatan Peninsula, unaware that we were heading to the birthplace of "sustainable tourism". Twenty-five years ago this week, the world's first eco-park opened its gates to a new kind of visitor. The very idea of eco-tourism was planted among the kapok and torchwood trees of south-eastern Mexico in the early 1970s by a pioneering American academic, Claus-Dieter Hetzer. He organised what he called "eco-tours" to the Yucatan for adventurous travellers. But this week marks the opening of Xcaret Park in December 1990, a travel destination that demonstrated the potential of sustainable tourism for the masses - a sector now worth an estimated half a billion dollars a year. In the 80s, most holidaymakers coming to this part of Mexico went to Cancun, a forest of modern high-rise hotels servicing the huge US charter holiday market. But it wasn't everyone's cup of tea. "The Europeans were worried that Cancun was going the way of Miami," recalls Yucatan hotelier Lorenzo Chan. "They wanted something that had a real Mexican flavour and started looking south." More daring holidaymakers headed down the "Cancun-Tulum Touristic Corridor", a prosaic name for the road into the less developed southern part of the Yucatan. Also surveying the rainforest and mangrove swamps of the area was a Mexican architect, Miguel Quintana Pali, searching for a plot to build his dream home. Miguel fell in love with a slice of coastal land for sale just north of Tulum. In fact, so enchanted was he by the location, he concluded it was "too beautiful for the few." A fiercely proud Mexican, Miguel teamed up with three businessmen - brothers Oscar, Marcos and Carlos Constandse - to create a travel destination in the jungle that would celebrate the beauty and richness of his homeland. From the very beginning, the project was to be an environmental attraction rather than a tourist attraction. They didn't realise it at the time, but they were pioneers of sustainable tourism. Miguel and the Constandse brothers christened the place Xcaret - a Mayan/Spanish word meaning small inlet. A little bay on the property, Miguel discovered, had been the port from which pre-Hispanic pilgrims visited the oracle of Ixchel on the nearby island of Cozumel. Ixchel was the goddess of fertility and Mayan women would have been expected to make the journey over the coral reef at least once. As the new owners explored the thick jungle, teeming with wildlife, they discovered ancient Mayan sites, the remains of commercial and religious buildings that had once served the crowds of pilgrims. 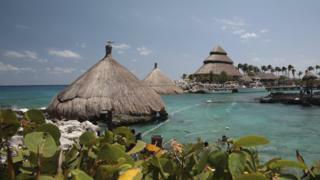 Xcaret had an ecological and archaeological importance, but would it be enough to woo modern-day travellers? In the early days, Xcaret was a simple place for tourists to stop for a swim and a meal on the way somewhere else. Miguel was ambitious, though. The touristic corridor was renamed Riviera Maya, and, much to the fury of the big city hoteliers further north, the park marketed itself with the slogan "When you visit Xcaret, don't forget to visit Cancun!" It was soon attracting large crowds. Not every environmentalist was convinced by the Xcaret model, though. It was a commercial enterprise, inevitably accused of turning virgin rainforest into a Disney-style theme park. Creating a network of underground rivers accessible to visitors also required a degree of earth-moving that led to criticism. For some there was a clear contradiction between mass tourism and environmental protection. But there were other ecologists who recognised the global travel market was expanding very rapidly and, unless they worked with it, the tourist industry would continue to throw up unsympathetic and damaging resorts beside every sandy beach. Image caption Can you encourage tourists while protecting the environmental and historic heritage of a site? This idea of eco-tourism needed a champion and, as serendipity would have it, he turned out to be a Mexican. Hector Ceballos-Lascurain was an environmentalist working with the World Conservation Union - an architect who wanted to design a framework around which eco-tourism could be built. Since a child, Ceballor-Lascurain had been passionate about the ecology and history of Mexico, particularly the archaeology of the pre-Hispanic cultures. He believed there had to be a way to promote, protect and profit from his country's heritage. "The main point is that the person who practices eco-tourism has the opportunity of immersing him or herself in nature in a way that most people cannot enjoy in their routine urban existences," he told one ecology journal. "The person will eventually acquire an awareness and a knowledge of the natural environment, together with its cultural aspects, that will convert him into somebody keenly involved in conservation matters." In the early 1990s Ceballor-Lascurain devised a definition for this new concept of eco-tourism: "Environmentally responsible travel and visitation to relatively undisturbed natural areas, in order to enjoy, study and appreciate nature (and any accompanying cultural features - both past and present), that promotes conservation, has low negative visitor impact, and provides for beneficially active socio-economic involvement of local populations." It was a concept that appealed to the Mexican government, keen to find a way to compete with other established Caribbean holiday destinations. One minister described their regional rivals as resorts that could offer "little more than sun, beaches and good hotels". Mexico's President Ernesto Zedillo demanded his country look to its "natural, ecological and cultural resources as fundamental inputs to greater development of tourism." For the entrepreneurs at Xcaret, the political and economic winds were blowing at their backs. The United Nations had recently stated environmental protection must be an integral part of the development process. Mexico's 1995 National Plan focused on sustainable development and even used the word "eco-tourism" to describe how to protect natural habitats and rural communities. Spanish money built a number of large resort hotels on the Riviera Maya, promising guilt-free holidays to conscientious travellers. Many chains worked with regulatory organisations like Earth Check to demonstrate their green credentials. At the Occidental Grand Xcaret next door to the park, for example, the manager stresses how the hotel had to be built around the mature trees on the site, paths in the gardens winding crazily to avoid important flora. "We had to work with the local ecological authorities every step of the way," Lorenzo Chan explains. "They would mark the places where we were not allowed to build. To this day they help us to follow the codes that allow us to get top ratings for sustainability." Sustainable tourism operators know that reputation is key. For almost 20 years Xcaret park has had a breeding programme for the endangered scarlet macaw, one of the most famous birds of the Yucatan. There are now about 900 of these fabulous creatures in the park, and dozens have been re-introduced into the wild. It also has a sea turtle conservation programme, which has seen almost 100,000 reared and released into the ocean. Some now return to the local beach to breed. "At the time we were rearing the baby turtles we thought we were saving lives," Xcaret communications manager Iliana Rodriguez recalls. "But we were saving our reputation. Only if you have genuine environmental projects on your property will the world of conservation start to respect you." Xcaret also sees itself as a guardian and reviver of ancient Mayan cultural traditions such as the ritual ceremony of the Voladores (flying men), as well as an annual mass canoe crossing to Cozumel recalling the pilgrimage to the shrine of Ixchel, and the Day of the Dead festival that has been celebrated in Mexico since long before the Spanish invasion. Local Mayan villagers are invited to the park to build traditional shrines to their dead ancestors, often incorporating food and other objects that were favourites of the deceased. In one of the more remarkable Day of the Dead events, school children learn how to embalm a corpse. There will always be some trade-off between development and protecting ecology and culture. Strict controls on the Riviera Maya limit opportunity for major expansion, but such is the demand that the airport at Cancun has now opened a second runway with direct flights from Russia, Germany and the UK. Well over a million visitors visit Xcaret Park each year and the business has other attractions along the old touristic corridor. Critics complain that the ideals of eco-tourism have got lost in the jungle. Some would still wish the Yucatan rainforest had been left untouched. But few will dispute the fact that the global tourist industry now finds itself held to account for its impact on natural environment and cultural heritage in a way unthinkable 25 years ago.